dots software, a subsidiary of Konica Minolta Business Solutions Europe, has recently released a new option for its print workflow solution AccurioPro Flux. Flux Preflight Pro enables the use of callas pdfToolbox to automatically check and optimize files for printing without requiring any additional manual steps. 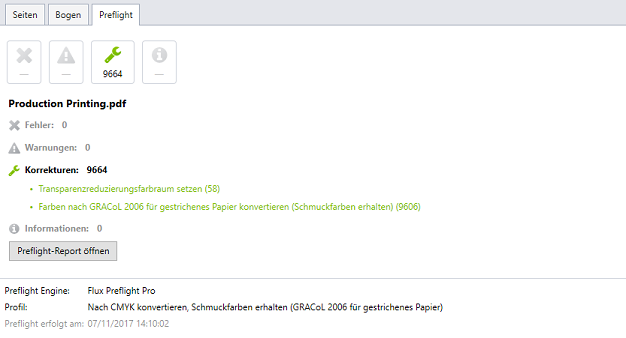 The successful OEM integration of pdfToolbox into AccurioPro Flux for preview generation and file conversion was the clear next step in intensifying the relationship between dots software and callas software. The new option for AccurioPro Flux, Flux Preflight Pro, allows users to apply preflight profiles from pdfToolbox. 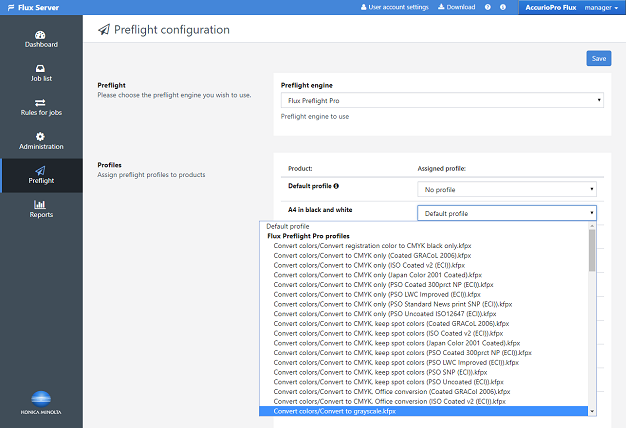 To do so, it assigns a suitable preflight profile to its print output during the configuration process which is then automatically used to validate and (if necessary) optimize print files as and when they are received. Print operators can also create their own profiles in pdfToolbox for use in Flux. Comprehensive reporting then keeps users informed of validation results and any changes made. Fig. 2: Incoming print data is validated using pdfToolbox technology and the results are shown to the print operator in a clear format. AccurioPro Flux is a modular print workflow solution developed by dots software exclusively for Konica Minolta. dots Software offers three versions of the product, depending on whether customers need to automate prepress processes, collaborate on printing work or deploy an online print shop. The base product, AccurioPro Flux Essential, is a toolbox for efficient pre-press work. The focus here is on automating common processes and centrally controlling all production devices, ensuring that productivity is significantly streamlined. As well as these pre-press tools, AccurioPro Flux Premium includes a central server which enables teams of print operators to collaborate on projects and provides a range of evaluation and control functions. The most comprehensive product, AccurioPro Flux Ultimate, also includes an online shop optimized for business customers which makes it easy to order printed products online. The Flux Preflight Pro option is available for the Premium and Ultimate versions of AccurioPro Flux. dots Software develops software solutions for digital production printing. Founded in 1997 in Berlin Kreuzberg, dots Software has been part of Konica Minolta Business Solutions Europe since 2005. Exclusively for Konica Minolta, dots Software is developing versatile print workflow solutions: AccurioPro Flux optimizes and automates the prepress process and enables the efficient management of print jobs. It simplifies the work in the team and allows the fast and uncomplicated online ordering of printed products.